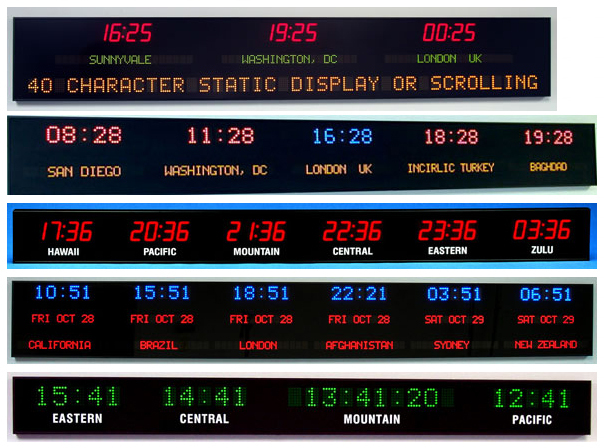 Application – Display any combination of time in the world. Digit Sizes – 1.8″, 2.5″, and 4″ digit sizes available. Digit Selectable – 4 digits (H:M) or 6 digits (H:M:S). Protective face – Non glare lens. Time Format– 12-hour or 24-hour selectable. Display Technology – Super-bright LED. Construction – Anodized aluminum frame. Daylight Saving – Selectable automatic international daylight savings correction. Memory Chip – Restores count following power failure. RTC Chip – One second a year accuracy (TCXO). Battery – 10 year lithium battery insures correct time after power failure. Custom Zone Layout – Vinyl or LED Lettering to your specification. Visual Design Rendering– Send us pictures of your applications and we will suggest affordable solutions for your visual communication needs.